Independence day, a feeling of total satisfaction is still elusive. Our finger tips are hyperactive from constant molestation of the remote, mobile phone and laptop, often at the same time. Sure, we celebrate Independence Day. You sported some buttons on Facebook, sent and received forwards, inescapably heard a few overplayed ‘patriotic songs’. And we are done till next year. If you still are not sure about the difference between Independence Day and Republic Day, do not worry, I am sure you have company which runs in tunes of many thousands. But at least we lived through it, right? …all this from the comfort of our living rooms. 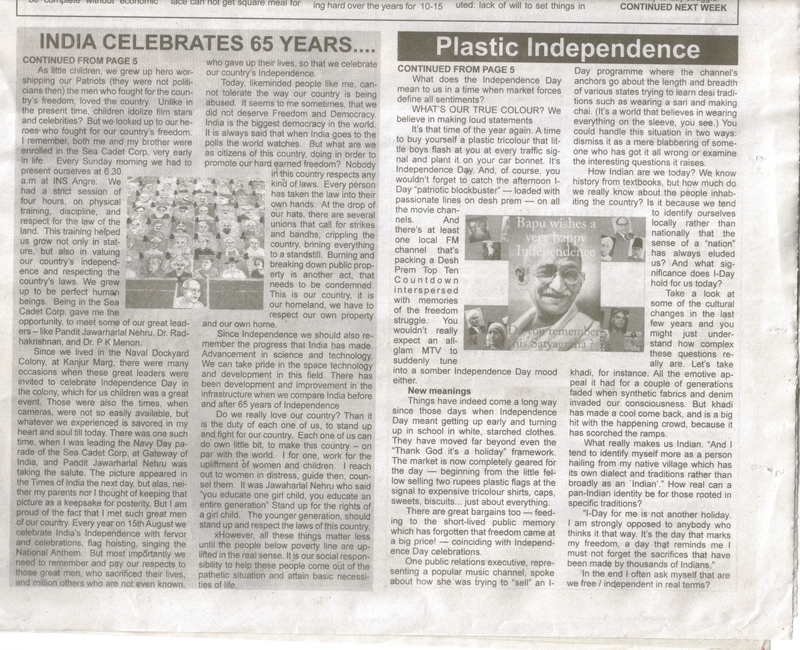 What does the Independence Day mean to us in a time when market forces define all sentiments? It’s that time of the year again. A time to buy yourself a plastic tricolour that little boys flash at you at every traffic signal and plant it on your car bonnet. It’s Independence Day. And, of course, you wouldn’t forget to catch the afternoon I-Day “patriotic blockbuster” — loaded with passionate lines on desh prem — on all the movie channels. And there’s at least one local FM channel that’s packing a Desh Prem Top Ten Countdown interspersed with memories of the freedom struggle. You wouldn’t really expect an all-glam MTV to suddenly tune into a somber Independence Day mood either. Things have indeed come a long way since those days when Independence Day meant getting up early and turning up in school in white, starched clothes. They have moved far beyond even the “Thank God it’s a holiday” framework. The market is now completely geared for the day — beginning from the little fellow selling two rupees plastic flags at the signal to expensive tricolour shirts, caps, sweets, biscuits… just about everything. There are great bargains too — feeding to the short-lived public memory which has forgotten that freedom came at a big price! 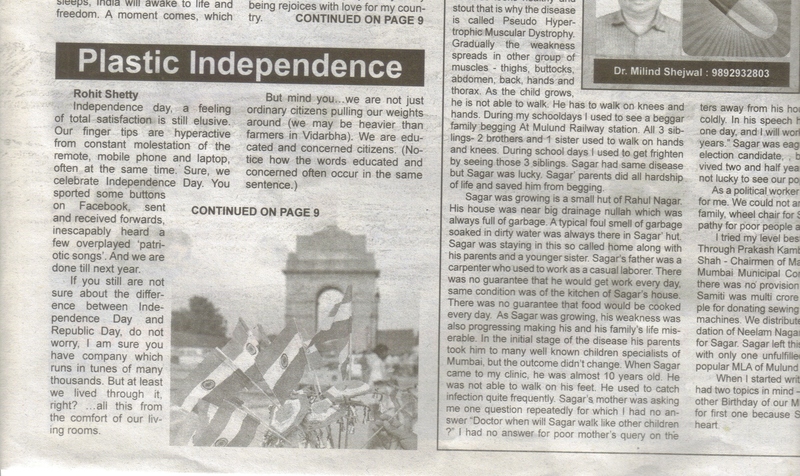 — coinciding with Independence Day celebrations. One public relations executive, representing a popular music channel, spoke about how she was trying to “sell” an I-Day programme where the channel’s anchors go about the length and breadth of various states trying to learn desi traditions such as wearing a sari and making chai. (It’s a world that believes in wearing everything on the sleeve, you see.) You could handle this situation in two ways: dismiss it as a mere blabbering of someone who has got it all wrong or examine the interesting questions it raises. How Indian are we today? We know history from textbooks, but how much do we really know about the people inhabiting the country? Is it because we tend to identify ourselves locally rather than nationally that the sense of a “nation” has always eluded us? And what significance does I-Day hold for us today? Take a look at some of the cultural changes in the last few years and you might just understand how complex these questions really are. Let’s take khadi, for instance. All the emotive appeal it had for a couple of generations faded when synthetic fabrics and denim invaded our consciousness. But khadi has made a cool come back, and is a big hit with the happening crowd, because it has scorched the ramps. What really makes us Indian. “And I tend to identify myself more as a person hailing from my native village which has its own dialect and traditions rather than broadly as an `Indian’.” How real can a pan-Indian identity be for those rooted in specific traditions? In the end I often ask myself that are we free / independent in real terms?